Magistrate Roby Benn remanded a 30-year-old vendor of Angoy’s Avenue charged with possession of 87 grammes of cannabis for the purpose of trafficking when he on Monday appeared in court. Kirk Campbell of High Dam, Angoy’s Avenue, New Amsterdam pleaded not guilty to the charges when they were on Monday read to him in the New Amsterdam Magistrate’s Court. In his defence, Campbell told the court that the day the lawmen visited his premises he had been weeding his yard. “A set of people run in my house, when they found the thing under the bed,” he said. 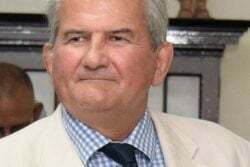 Police Prosecutor Phillip Sherriff told the court that on June 19, at the said location the defendant had a quantity of cannabis in his possession. The narcotic was weighed and amounted to 87 grammes. He explained that police conducted a search in Campbell’s home, specifically his bedroom, in his presence, when the narcotics were found. The prosecutor then argued that there were no special reasons for bail to be granted after the defendant stated that he should be granted bail. Campbell was ordered to return to court on July 2 for trial.